Unfortunately, this unnecessary and expensive option has been implemented by Wiltshire Council following a lengthy consultation process. Unnecessary because there was a straightforward, no cost option which was simply to take the 'new' Corsham Primary (CP) gate out of use. However, as our public bodies (I will call CP a public body even though it has academy status) appear unable to make reasonable decisions, both within and between themselves, this urbanisation of our beloved countryside has come to pass. There is no need to go over old ground here other than to remind the reader of the long saga over the 'new' gate which actually starts with an article entitled 'The saga of the new gate' at the foot of this 'News' page. A link to the 70-page file of email exchanges between September 2010 and January 2014 is given below the 'saga' article. Also relevant are the articles on this 'News' page dated 2nd October 2013, 11th November 2013, 13th December 2013 (the date of an accident), 17th December 2013, 13th January 2014, 26th January 2014 and 21st March 2014. Note that the photo shows a relatively litter free Bradford Road. Sixteen bags of litter were collected between Rudloe Fiveways and Northleaze mobile home park last weekend, 14th and 15th February; the litter now having been replaced by 'official' clutter - yellow lines. And ... these lines were supposed to be 'heritage primrose' because of the rural nature (currently anyway) of the site. On the Web, you will find many 'hits' for the above: 'small acts of kindness' or 'random acts of kindness'. Rudloe is no different but also has another category: 'random inconsiderate acts' or perhaps 'deliberate inconsiderate acts'. The vehicle shown below, presumably belonging to a member of staff or parent (I stand to be corrected) was left parked outside the school, in Bradford Road, overnight on 20th/21st March causing traffic hold-ups and requiring eastbound vehicles to switch to the westbound lane. The ad. on the back of the Faresaver bus is ironic and apposite. 'Nowhere to park?' it says. Yes - there are plenty of parking spaces in the Community Centre car park opposite the school main entrance. Rather late in posting this 'News' item as it could be found in a Wilts County Council notice in The Wiltshire Times 17th January edition. Wilts County Council proposes 'no parking at any time' yellow lines (heritage primrose actually) on the Bradford Road and at the entrance to Rudloe Estate (Westwood Road). 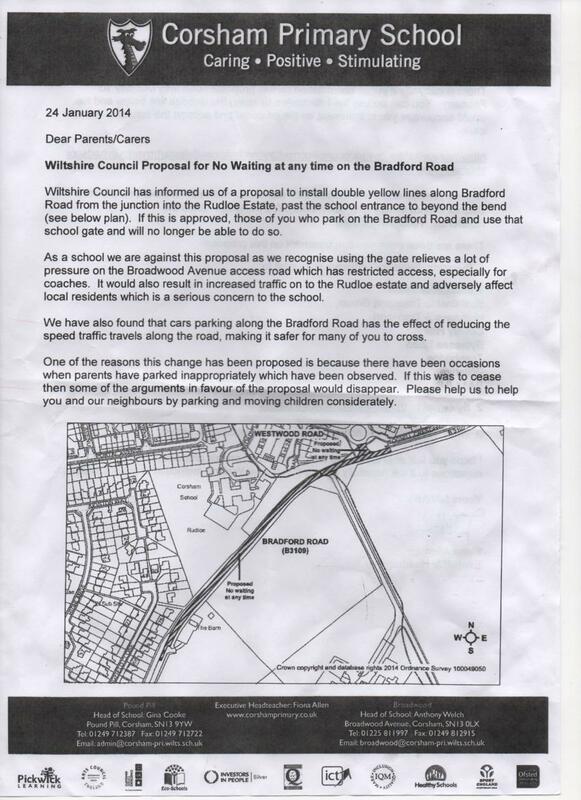 This is, of course, Wilts CC'c solution to the outrageous parking on the Bradford Road outside the 'new' school gate. And the cost of this solution? Many thousands of pounds no doubt. A better solution, which would cost the ratepayer absolutely nothing, would be the simple turning of a key in a lock (a trope). But academies are outwith the democratic process - they are, it seems, a law unto themselves. This is the school's pamphlet on the 'no waiting' proposal. This "caring" school appears not to care about traffic chaos, danger to road users and pedestrians, putting children at risk and physical injury resulting from an accident (see 13th December article) caused by the parking. No, the example the school wishes to set is that of lack of consideration, reason and common sense. A fine lesson for the children. This pamphlet also demonstrates a complete lack of joined-up thinking with regard to the 'school's' grand plans for expansion. The 17th December video below reflects on the 'school's' role in the Bradford Road speculative development. The road and access plans for this speculation include a 'ghost island right-turn lane' and 'uncontrolled crossing' in the Bradford Road in the area of the school gate. This proposal allows traffic to turn right into the new speculation (and the proposed parking for the school) without hindrance to traffic flow. Are you following .... if parking continues here, the road will be completely blocked. So, either way - present danger or future blockage (if the speculation is approved by Wilts CC planners), parking cannot continue here. And these are the people we put in charge of our children's education. Insensitive is right but is really a euphemism for the inconsiderate, irresponsible, ridiculous and outrageous actions of the school authorities in the first place with the installation of the gate and then the eighteen or so parents who park their cars there. See the situation today, with one car being left on the road, close to the bend, way after school start time. I notice that police arrived at the Estate at around 9:10 - I trust to find who was responsible. The first photos show the location of the parked car, the manoeuvre of a 32-tonne truck travelling east and a 44-tonner travelling west past the car. The second photos show the empty Rudloe Community Centre car park directly across the road from the school main entrance on Rudloe Estate. Following last Friday's accident, a local media man has produced a video of traffic problems outside the Corsham Primary Woodland School's new 'equal opportunity' gate. All footage was taken on a single day and illustrates the phrase that many locals have used - "an accident waiting to happen" but which should now, of course, be "another accident waiting to happen". On Friday 13th December (ironic! ), a 17-year-old local motorcyclist, Kieron Kellett, collided with a parked car outside the Bradford Road entrance to Corsham Woodland School. The accident happened at 4:20pm and the road was closed while the emergency services attended. Kieron was treated at the scene by the ambulance crew but his injuries required further treatment at Frenchay. The on-scene treatment and accident investigation necessitated road closure until around 6:20 pm. The picture caption is, as you may gather, rather ironic too as there is far more opportunity here for an accident than at the school main entrance. On my walk to Italian class this morning at about 9 a.m., all children were in class but four cars remained with four parents chatting. Great place for a chin-wag with 44-tonne trucks, buses and agricultural vehicles thundering by (or, in fact, being held up by inconsiderate people). Great place also to load or discharge (not the best words I realise) the disabled (the ostensible reason for the Bradford Road gate). Photo was taken on my return journey showing one of the dozens of 'motorway maintenance', 32-tonne, trucks that pass this way daily. Notice, as with the picture from 2nd October, how the driver is taking an 'avoiding line' because of the pedestrian (some people realise the dangers involved). The article and three-year email chain about the 'new' Corsham Primary Woodland School gate on the Bradford Road can be found at the foot of this 'News', 'Rudloe' webpage. Circumstances found me walking up the road today with my camera - the resulting pictures, which speak for themselves, are below but the captions give a little further information. Click on the pictures to enlarge and view captions. The 'old', safe Bradford Road entrance, above and away from the road and behind a barrier (designed this way for the safety of children and used, without problems, for 26 years). The extraordinary story of the ‘new’ (2010), Bradford Road gate at Corsham Primary School, Broadwood site, now renamed Corsham Primary Woodland School, would be hard to make up. Other local schools, St Patrick’s at Corsham, Shaw Primary and, indeed, Corsham Primary main site in Pound Pill have severe traffic problems at school start and end times because there is no significant off-road parking. So what do the ‘authorities’ at the Broadwood/Woodland school decide to do? After 26 years during which time the school had no significant traffic problems, it was decided to open a new entrance on the heavily used Bradford Road, thus creating significant traffic problems. In addition, a safe (high above road with barrier) pedestrian entrance was closed with parents/children now having to walk 100 metres along Bradford Road. All sorts of quite bizarre reasons have been given in order to justify this decision but all defy logic. Reason 1: the school is now drawing pupils from a wider area (Katherine Park and Box). The school has always drawn from a wide area (see the Box Highlands school bus route in the map below from 1979/80 which shows a pick-up point at Hudswell); anyway, having driven miles from these ‘remote’ areas, parents could surely drive the additional 200 metres onto Rudloe Estate? Reason 2: there were traffic/congestion problems on Rudloe Estate at school start/end. I monitored the school traffic over the course of a week and found no problems. In any case, the adjacent Rudloe Community Centre has offered its 30-space car park to parents (18 parents, or thereabouts, now park on the Bradford Road). Reason 3: the old pedestrian entrance a) cannot be seen from the school and b) is not suitable for pushchairs/people with disabilities. For ‘reason’ a. to be valid, members of staff must watch both school entrances at all school start/end times; this does not happen. In any case, the child now made to walk the 100 metres down the Bradford Road “cannot be seen from the school” (but can, of course, now be seen by passing motorists). Regarding reason b. I monitored this entrance for two weeks and not one parent coming from the west of the school had a pushchair. Anyway, this entrance had been used for 26 years without any problems, so what had changed – certainly not the parents or their ability to climb half-a-dozen steps! Regarding people with disabilities, the main school entrance not the Bradford Road with 32-tonne trucks, buses and agricultural vehicles rushing by would be appropriate for the disabled whether arriving by car or on foot. From the Box Highlands school handbook of 1979/80, we may see the changes that have taken place in the mentality of school officials over the past thirty-three years, from 'common sense' to 'jobsworth'. The 1979/80 handbook states, "the approach roads to the school represent a potential danger to motorists, pedestrians and cyclists alike. To help reduce the dangers, parents are asked to operate a voluntary one-way system when dropping or picking up children in cars." Today's response to traffic dangers is, "We are not qualified traffic officers and as such this matter must be undertaken by Wilts Council Highways Department." Despite protestations over the three years since its opening, including petitions from Box Parish Council, the school authorities continue to defy reason. The content of the ‘link’ below shows the battle that has gone on over this entrance. 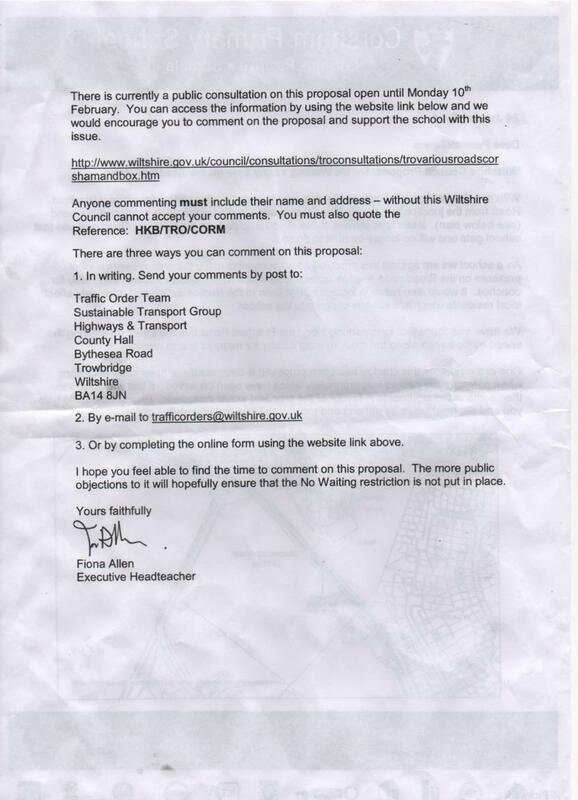 The reader may see that all emails have been addressed to the school authorities, Wiltshire County Council, Wiltshire Police and Box Parish Council but after initial responses and meetings with the school and governors in 2010, no further responses have been forthcoming. Only now, in August 2013, has Wilts County Council requested a meeting on this subject! One wonders why now, after three years?